A computer is used for so many purposes today that it can become a real studio for some users. People need speakers that could satisfy needs like watching movies, playing games, or listening to music. While some of you may just want to upgrade their old and simple stereo speakers, others may want to have a surround system that will keep them immersed in their favorite games and movies. Depending on your needs, you can choose from stereo speakers (2.0) and systems with surround sound and bass boost (2.1, 5.1, or 7.1). In order to find the right system for your needs, you have to know the purpose for which you will use it. If you just want to listen to some music from time to time, you occasionally watch movies, you play games rarely and you just want to have sound for your office tasks, a stereo speaker system can be a decent choice. However, if entertainment is something really special to you and you pay attention to every detail of your multimedia experience, you should always look for a system that has a subwoofer, bass control and high quality sound. Buying an expensive system is not always the right decision, as there are inexpensive products that offer enough features to please any type of computer user. 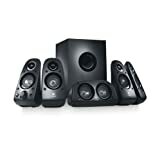 You can find great audio systems under 100$. 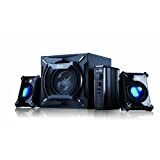 Each of the following sound systems is meant for a specific type of user, from the user who wants a simple and cheap sound system that is decent enough, to the user who wants a complex sound experience. The difference in price for all three systems is quite small. 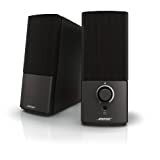 Bose Companion 2 Series III Multimedia is one of the best speaker systems for PC that you can find on Amazon, with more than one thousand satisfied buyers in the two years that have passed since it was released. The manufacturer has more than fifty years of experience. One of the main advantages of this system is the price and another one is simplicity. The left speaker and the right speaker are interconnected and there is also a cable that goes to the computer and one that serves as a power cord. Because the right speaker is the main unit, everything connects to it first. You have volume control and a jack connector for headphones on the front of this speaker. The general appearance of this system is classical, with speakers of a smaller size. Even if they are small, these speakers sound quite loud. You get a decent audio quality and a wide space is covered by the sound. Low frequencies constitute the main focus, despite the fact that there is no separate subwoofer. It works well in games and movies, with a warm feeling for voices. The system from Genius can be great not only for movies and games, but also for music lovers. There are three variants of this model: 1250 (38 Watts), 2000 (45 Watts) and 3000 (70 Watts). Small differences exist between the three products. Genius is a big name in the field of computer peripherals and is well known for its high quality speakers. GX Gaming is the new division of the company that is dedicated to gaming. Genius SW-G2.1 is a three piece system that has a wooden subwoofer with the sound cone on the front, two small satellites and a vertical stand with jacks and controls that is also meant to serve as a remote control and an external amplifier. Because the system is more focused on gaming, it has an excellent bass response. On the back of the amplifier, you have the input and output outlets for satellites and subwoofer, an auxiliary input outlet, a microphone outlet and an On/Off Power switch. Despite the small size of the satellites, the sound is loud. Logitech Z506 uses the analog technique for providing a 5.1 sound to serve as a multimedia home cinema system to suit any requirement for entertainment. Logitech is another manufacturer of high quality products for computers, including great speaker models. With every cable being color-coded, setting up the system becomes really fast and easy. This model is actually an upgrade from a model released in 2006 that had a wired remote control. The volume control can now be found on the right speaker and the control for bass in on the subwoofer. You can place the center speaker on a computer monitor, as it has clamps. You can also connect the system to a game console through the auxiliary ports (two RCA jacks). With 75 Watts of RMS power, you benefit from a rich sound that will fill your room and make you ecstatic.